Tom Blakely of Maryhill Harriers was born in Glasgow 11th July 1904 and in the course of his career set two records for the Three Miles, one for Two Miles, and won a Scottish title over Four Miles as well as being a good cross country and road runner. Unlike some others, he did not spring immediately to prominence. Despite winning team gold in the National in 1926, he was by no means a fixture in club teams either cross-country or on the track – indeed in the St Peter’s inter-club championship which featured relays over One Mile, Two Miles and Four Miles with a Two Miles Team Race he seldom featured for most f his career. He took his time to mature. Not among the prize-winners over the 1926 summer season, his first run in the National Cross-Country Championships was in season 1926-27 when he was fifth counter for the winning Maryhill Harriers team having finished in 14th. The following summer his name appeared several times in the results (eg Maryhill Harriers championships mile which he won) but not in any major meeting. Although he ran well the following summer, he did not appear too often in the Press: possibly because although there were many two mile team races, only the first three across the line plus the three counters for the winning squad were listed. Given that J Suttie Smith, D McLean, F Stevenson and Dunky Wright were among the top men of the time, it was perfectly possible for Blakely to be fourth in such a and not have his result reported. On 4th June 1927, Blakely was fourth in the invitation three miles team race at the Queen’s Park Sports. Maryhill won with the counting men being McLean first, Blakely and Dunky Wright eighth and a total of 13 points to Monkland’s 14. After missing the SAAA Championships in June, Blakely won the Four Miles at the Ayrshire Championships at Rugby Park, Kilmarnock, in late July in 21:24. He was not a prize winner at any recorded meeting subequently in summer 1927. Winter 1927/28 and with Maryhill not in the first six at the District Relay and Blakely not in their scoring runners in the National, it was on to the summer of ’28. Maryhill Harriers was a very strong club at that time as the comment in the ‘Glasgow Herald’ of 4th June makes clear: “It was generally exected that with the strength at their command Maryhill Harriers would take pride of place at the inter-club contest organised by that enterprising young club, St Peter’s AAC. 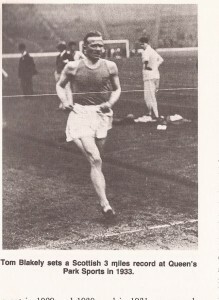 In the mid-distances with D McLean, WH Calderwood, W McRoberts, G Inglis and A Maer, they have a string that no other club can compete with at the moment.” Blakely was given time to mature as an athlete without demands being made upon him – although he might have liked some team competition to help the process along. The first mention of Blakely in the ‘Glasgow Herald’ that summer was on 23rd July at Beith where he contested the Four Miles Ayrshire Championship – he is reported to have had little difficulty in retaining the title and finished the race alone. It is intriguing to realise that with all the events contested by members of his club, this is his first noted victory of the season. That cross-country season there was no sign of Blakely in the club team in the District Relays on 25th November, nor was he in the winning national team, which was made up of DT Muir, D Wright, WH Calderwood, AW Adams, Kellas and D McNab Robertson. No shortage of talent over the longer distances either. Summer 1929, and again no sign of Blakely among the team membership or prize winners. We next see him at the end of season 1929-30, when Maryhill Harriers team won the National championship and Tom Blakely in sixteenth place was the team’s third counting runner. In the Edinburgh to Glasgow – the first of its kind – held on 26th April, Tom ran on the sixth stage and maintained third place for the team that would finish third. He had not run in either of the Maryhill teams in the Midland Relays in November 1929 but these were two very good races for a relative newcomer. There was no place for him in the scoring six in the National and his name did not appear among the prizes all summer of 1929, not even being named as an ‘also ran’ in the SAAA Championships. His best running however was just about to begin. In the winter of 1929-30, he was not a member of either A or B teams in the first Midlands Relay at Bothwell. By the National however, he was racing well enough to be sixteenth and third club counter for the winning Maryhill team to pick up his second team gold. The first ever Edinburgh to Glasgow eight man relay was held on 26th April and Blakely was fastest runner on Stage 7 where he maintained third place for the team that finished in that position. Straight into the summer programme after that. On 7th June 1930 he was in action again as third team counter in the Maryhill team which won the two miles team race at the Queen’s Park FC meeting at Hampden, with McLean winning the race, Calderwood being third and Blakely finishing in seventh. But again, he was not to be seen in the SAAA Championships, the Rangers Sports, any of the Ayrshire meetings or indeed anywhere for the rest of the season. In the West District Relays in November 1930, he was only in Maryhill Harriers B Team, running on the fourth stage but running faster than one of the A Team. Missing the Districts, he was 15th in the National to be the Maryhill last counter for the winning team to take his third National team gold. In the Edinburgh to Glasgow in April, he had fastest time and set a new record on the seventh stage as part of the silver medal winning team. On 13th June, 1931, Blakely was part of the squads for the Mile team race with D McLean and WH Calderwood and also of the Three Miles Team race at the St Peter’s inter-club event at Celtic Park. His next outing was in the SAAA Championships on the 27th of the month where he is noted as among the also rans in the Four Miles, won by RR Sutherland. At the popular West Kilbride Sports on 18th July, Blakely was third in the One Mile championship of Ayrshire which was won by clubmate WH Calderwood. His biggest moment of his career so far was at Ibrox on 1st August when he won the Four Miles from W Beavers of York and JF Wood of Heriots. Behind him Paavo Nurmi ran 19 minutes 20 2-5th seconds, a new all-comers record. Blakely was running from 400 yards, Beavers from 190 and Wood from 200 yards and he won by 15 yards. Then on August 15th at Springburn Harriers meeting, he was third in the Mile off 60. One week later at Darvel Week Sports, he was second in the Mile off 55 yards. Regardless of the Ibrox race, it had ben his most successful season yet but next summer would be even better. In November 1931 at the District Relays Maryhill Harriers finished 6th. Blakely ran second for the first team and had second fastest time for the club. The club won the National in March, 1932, Tom Blakely was 21st and fifth counter . There was no Edinburgh tro Glasgow in 1932 so it was into the summer season. It had been a very good season for Blakely with a record and a national title and the remarks of the press reporters on the ‘rapid rise’ are interesting. One week later at the Queen’s Park FC Sports, he set yet another record, in the three miles this time. The SAAA Championships were at the end of June 1933, and the results reported ‘Holder T Blakely did not compete.’ In fact I can’t find him among the prize winners for the remainder of that year, nor was he in any of the Maryhill teams that won a few races. Their dominance was being challenged by Shettleston and Plebeian in a way that it had not at the start of the 30’s and Maryhill was changing from the middle distance dominated club of Calderwood and McLean to the distance orientation of Wright, Robertson and Farrell. Given the form that he had displayed, the chances that Blakely was handicapped out of the prizes are high. In winter 1933-34, he ran the third stage of the District relay and was fastest Maryhill Harrier again but did not run in the Edinburgh to Glasgow. As has been noted, did not run in the National, or at least was not in the counting six men. He did not appear again in any championship race, and as far as can be ascertained was never again among the prize winners. His had been a very interesting career – a long slow burn over four or five years then another four years or so of brilliance with two Scottish Three Miles records and one Two Miles record, a Scottish championship, gold, silver and bronze medals from the Scottish cross country championships, the West and Midlands cross-country relays, and the Edinburgh to Glasgow relay. Tom Blakely died in Glasgow on 3rd September 1980.